Take a little more transit and eat a little less meat — two things you can do to reduce your impact on the environment. In this installment of Meatless Mondays with Metro, let’s take a trip to Krimsey’s Cajun Kitchen in North Hollywood. Dubbed the world’s first completely vegan Cajun restaurant, Krimsey’s menu not only consist of traditional Cajun food but is completely cholesterol free! It has all of the Cajun flavors that everybody loves and expects in a Louisiana-style meal, minus the meat and dairy. Spice lovers may want to start with the Cajun jambalaya. 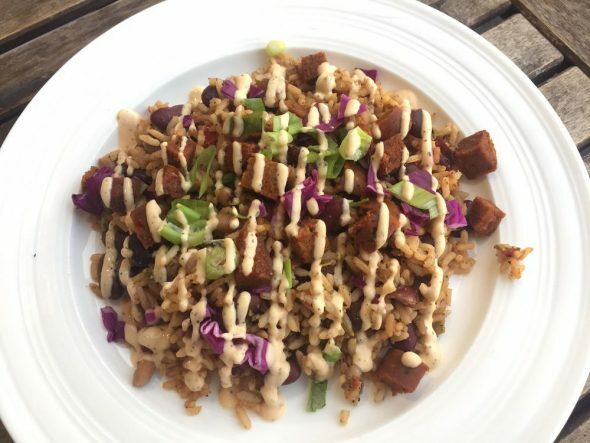 The plate contains Cajun-spiced rice, kidney beans, black-eyed peas, bell peppers, onion, garlic and veggie sausage slices topped with fresh green onions, red cabbage and spicy house sauce. Another popular item on the menu is the New Orleans Po’boy. This traditional Louisiana sandwich consists of battered hearts of palm served on toasted French sourdough bread with mayo, shredded lettuce, sliced tomatoes, dill pickles and the spicy house sauce. 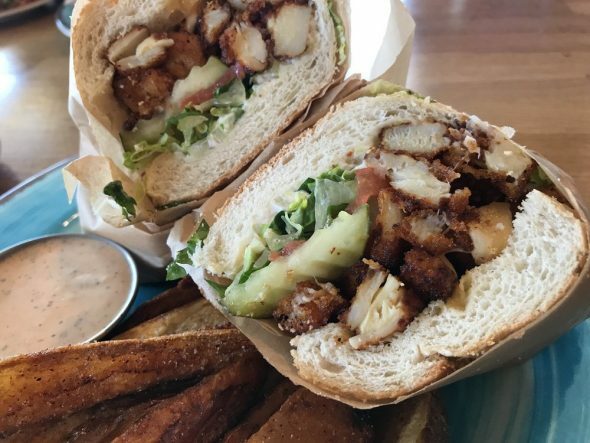 Each sandwich is served with Zapp’s Voodoo potato chips. To get to Krimsey’s Cajun Kitchen, take the Metro Bus 164 or 167 to the Coldwater Canyon/Victory stop. I recommend Native Foods, a vegan restaurant which is in Westwood, 1 1/2 blocks north of Wilshire Boulevard, on Gayley Avenue. It is near the Metro #720 Rapid bus route, the Metro #20 bus route, and many bus routes which the Santa Monica and Culver City bus systems operate into Westwood.